I wanted to share two final pics of American Dippers I took last week-end. 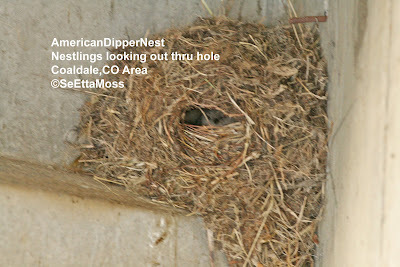 This shows an American Dipper I found in Salida that adapted to it's situation. 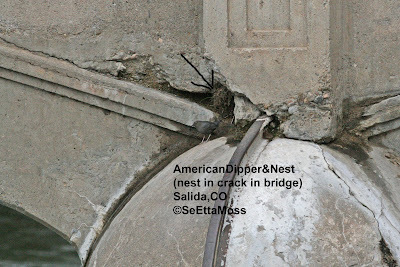 The bridge where it is nesting is curved on the underside and has no walls perpendicular to the water on which to firmly attach a nest so this bird built it's nest in a crack in the bridge where some of the cement has fallen apart. Since there is a lot of kayaking under this bridge and a walking trail under one sde, it is also best that the nest is in the nest is in the center where it has some protection. The second pic is just an enlargement of the top pic showing the dipper with the nest above it (where the arrow points). I took pic of nest from about 75 feet away, again handheld. These are pics of one (or possibly both) parent birds in the prior post. The top pic shows the parent bringing a small insect to the nestlings. Notice the small drops of water on it's plumage, a demonstration of how well their feathers are waterproofed by oils from the preen gland. The second pic is an enlargement of the first pic so that it shows clearly it's third eyelid, a white one, called a nictitating membrane "which acts as a windshield wiper when underwater" per the Smithsonian Zoological Park website. I took the third pic as the dipper was starting to "dip" into the water. The fourth pic is an enlargement of the third pic that shows the dipper's eye and bill quite nicely. Over the week-end I birded my way to Salida through the Big Horn Sheep Canyon from my home in Canon City. The Arkansas River flows through this Canyon and there are several locations where I stop to look for nesting American Dippers. As I stood looking at an obvious American Dipper nest under a bridge in the Coaldale area, a parent dipper flew in with food and I got the first photo that shows the fledgling peeking out after the parent bird left. 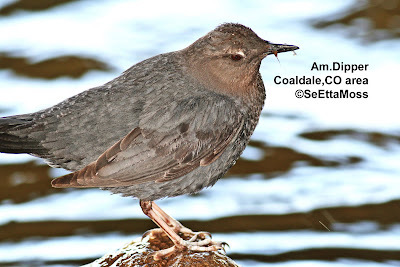 The second photo is just an enlargement of the first photo and it shows the fledgling dipper better. It's bill is clear while the outline of it's head can be discerned. A little of it's left eye can barely be seen but it's right eye is more visible. and almost looks reddish with a hint of yellow. From American Bird Conservancy: "We need your help to dramatically increase funding available for the conservation of migratory birds. Please can you Act for Songbirds today? A bill has been introduced in the Senate and a companion bill in the House, to reauthorize the existing Neotropical Migratory Bird Conservation Act at significantly higher levels. By sending a message to your Senators and Representative, you can ensure that both bills pass for the benefit of birds. Thanks to these bipartisan bills in the Senate and House, funding could be dramatically increased from the current authorized level of $6 million to $20 million. All grants made by this Act must be matched by other funds at a ratio of 3:1, meaning every one tax-payer dollar from the Act leverages three from private sources. Overall, the program could result in some $60 million in additional funding for bird conservation!